1)It helps you control or regulate your hormones. Jackfruit enhances your immunity and protects you from common diseases. 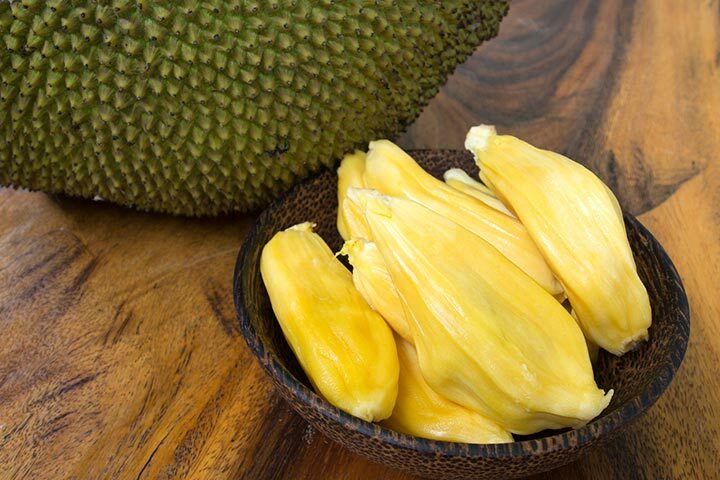 Jackfruit controls your stress levels during pregnancy and even while you are lactating. Jackfruits also help improve vitamin A levels, which are crucial for your fetal development, eyesight, and cell multiplication through mitosis. Jackfruit is low in sodium and saturated fat contents. It can provide as much as 11% of total fiber content required in a day. The fruit has anti ulcerative and anti hypersensitivity properties. Jackfruits are rich in vitamins A, B, C and D, as well as fiber. With a good amount of carbohydrates, jackfruits are capable of providing you with 95 Kcal of energy. Jackfruits are a healthy package of Beta-carotene, calcium, magnesium, iron, phosphorus, potassium and zinc that are essential for your body, especially while you are pregnant. Jackfruits lower your blood pressure effectively during pregnancy.